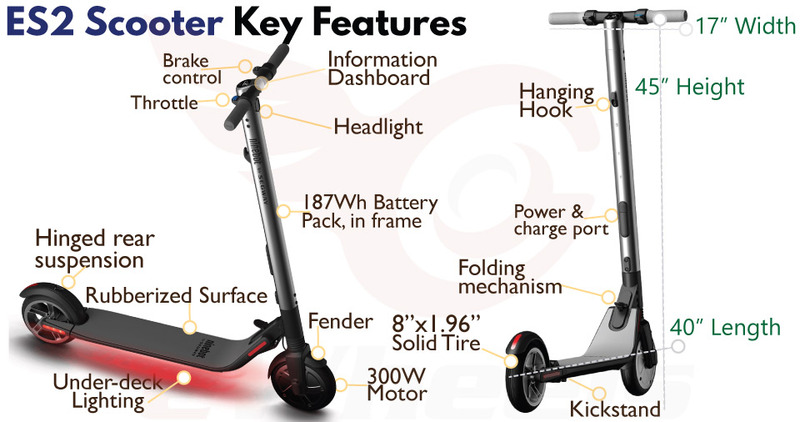 Respectable specifications, gives you the option to purchase the basic Scooter first & then upgrade the battery to give you greater speed, range, performance at a manageable upgrade cost. 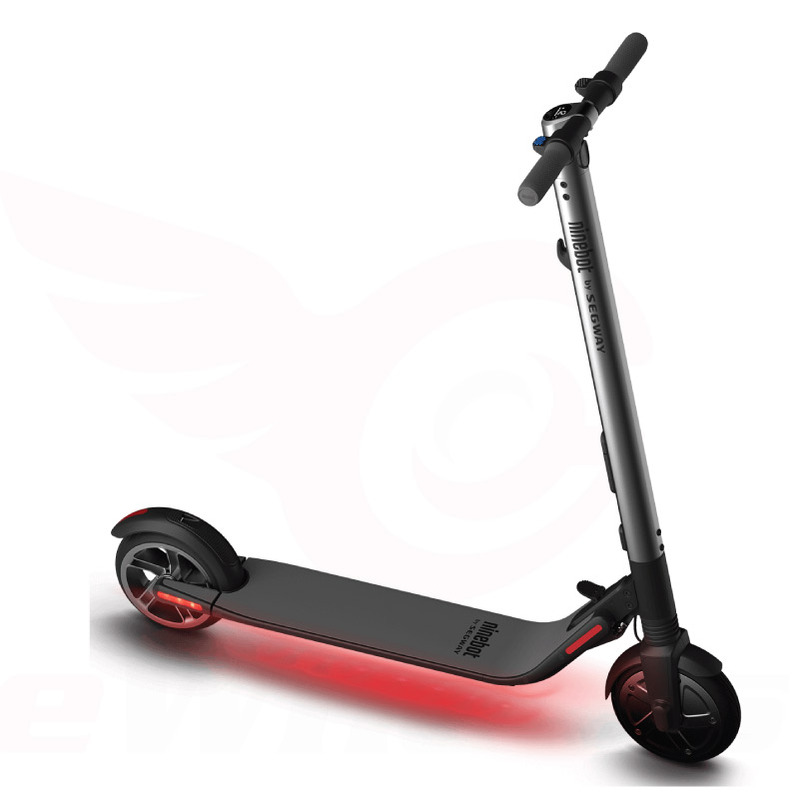 Cruise-control, both regenerative & mechanical braking, Bluetooth App, atmospheric LEDs, riding lights, kickstand, this Scooter is fully loaded & ready to go! 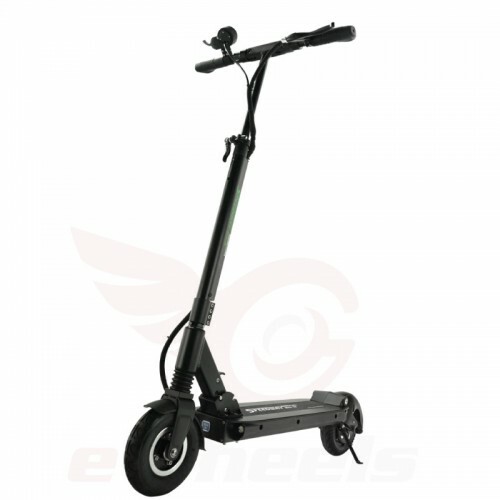 If your budget is around the $500 range, it is unlikely you’ll find a better Scooter than ES2, from one of the most established & experienced Company’s in the business. In comparing to the ES1, this model has a 3MPH+ higher top speed, a more powerful motor, front & rear shocks (ES1 just has a front shock absorber), rear brake lights & cool customizable LEDs through the App. 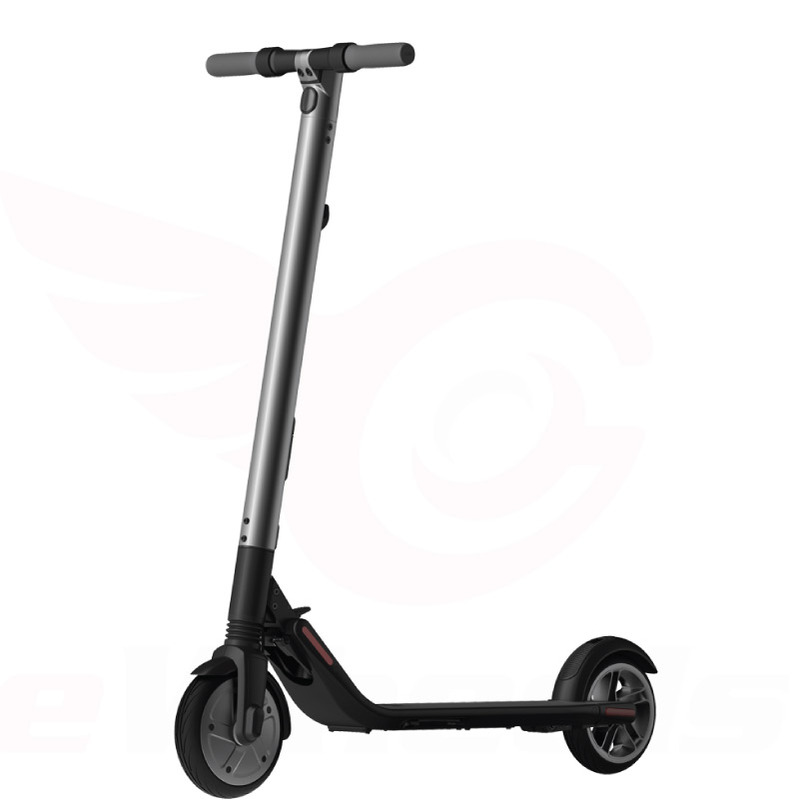 On seeing this Scooter in person, you are immediately struck by beauty & simplicity of the design—the ES series has recently won a design award. Once you turn on the under-deck LED lighting, it raises the wow factor to 11. The Designers choose to use solid rubber tires, minimizing downtime from punctures. 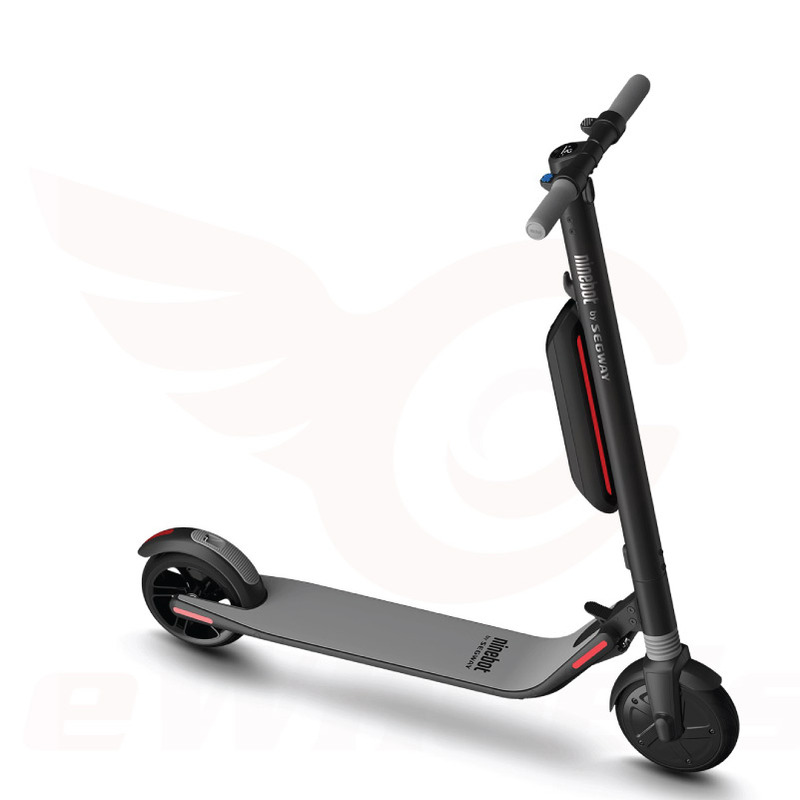 The general impression that the scooter makes, is that it’s built to an exceptional standard, especially for the price point. With the optional snap-in 187Wh battery pack, you can upgrade your ES2 in seconds; this not only doubles your range, but when the intelligent control-system detects the additional pack, it automatically increases the speed from 15.5MPH to 18.6MPH, while also giving you a power boost better acceleration & hill climbing. 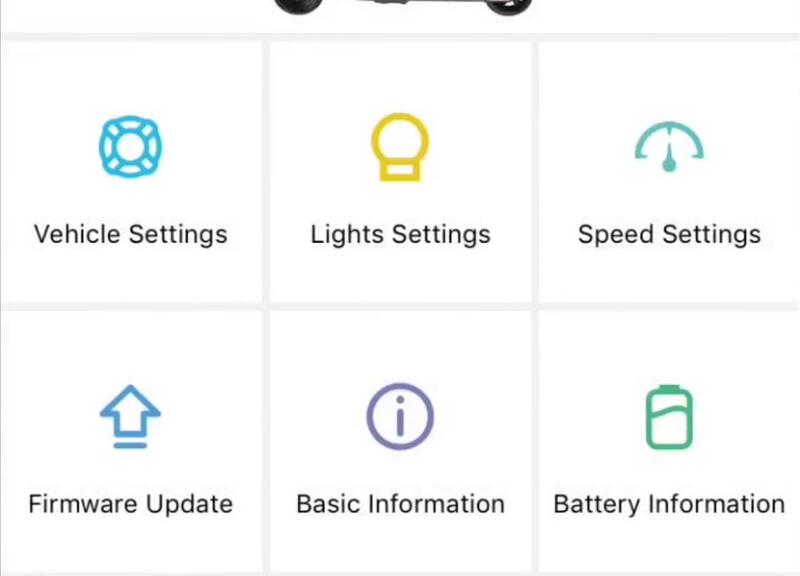 The backlit LCD Dashboard gives you an overview of the Scooter’s vital stats, like the speed, Bluetooth status, power mode, & battery level. It’s designed to be visible in direct sunlight & from a variety of angles. 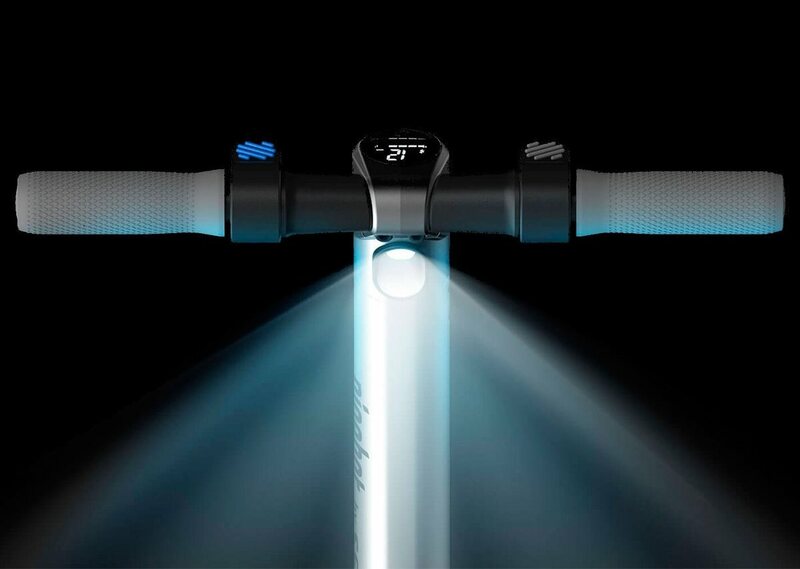 You can activate the front/rear lighting by pressing & holding the power button down for 2 seconds. 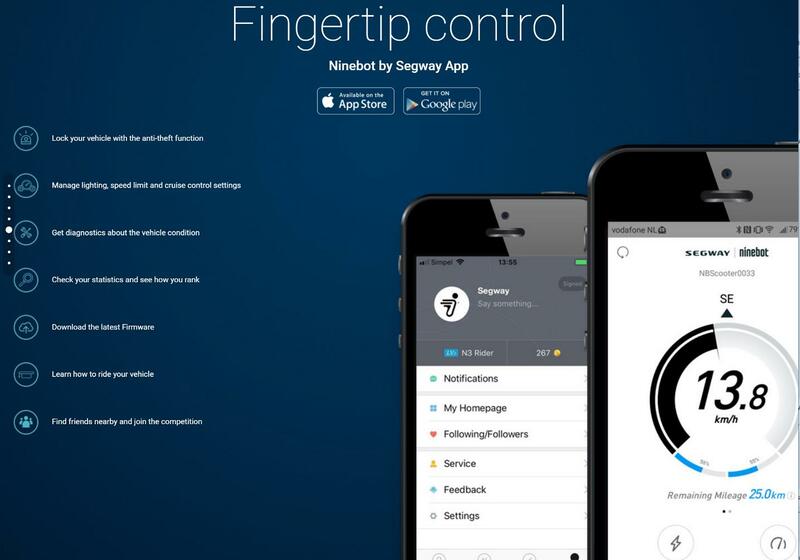 Other configuration setup can be performed from within the Ninebot App. 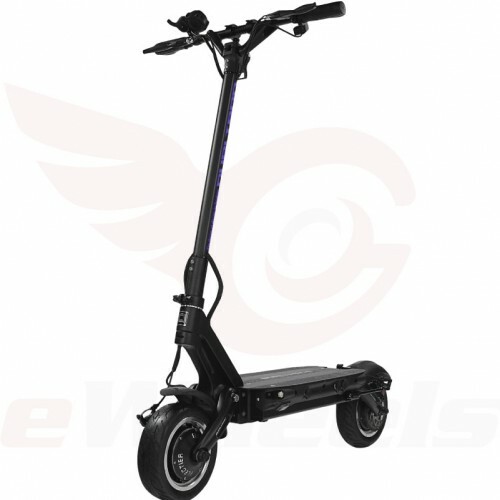 The coolest feature that made the ES2 attractive to us at eWheels, is the external battery pack option. 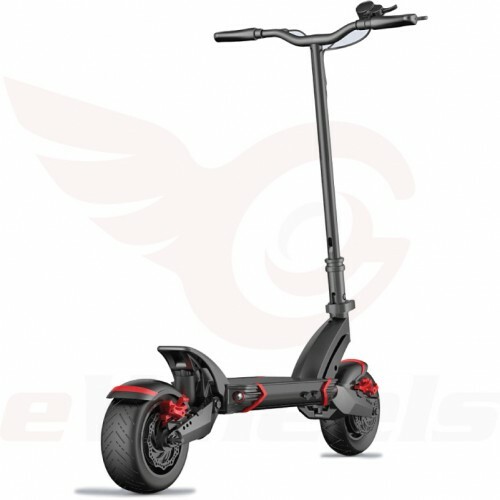 Ninebot markets the ES2 + battery pack as the ES4. There are a few other products where you can plug in an external pack, to supplement the primary, but what is exceptional about the implementation on the ES2, is that the controller adapts its maximum speed & power once you plug it in. 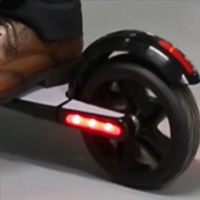 Furthermore, these batteries can be charged independently of each other, thus doubling the charge rate, minimizing downtime for waiting to top up your Scooter. 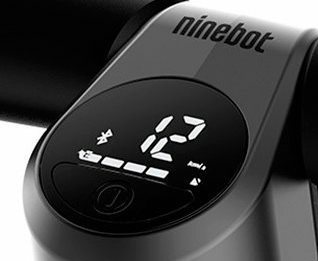 Ninebot claims that the two batteries can be used at different charge levels; if this is true, it means you can also slot in the external one, to continue your journey, if the integrated pack is running low. From our fairly extensive experience with battery powered transport, we’d recommend keeping both pack at the same level for maximum performance. Ninebot’s App is available on both IOS & Android, one of the better Apps produced for the Electric Transport manufacturers. Use the App to set the lighting color, theme of the atmospheric under running-board LEDs. 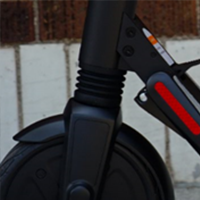 With this feature, you can personalize your Scooter in minutes, to set your unique finishing touch to it. This is ‘passive’ braking, on releasing the throttle control, the motor applies a weak braking force through the regenerative system. There are three different levels that can be applied: weak, medium, strong. Once enabled, by maintaining the speed for 5 seconds, the Scooter will continue that speed when you take you finger off the throttle. 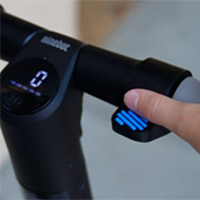 It can be deactivated by pressing the throttle again, or the brake control. I see that the ES2 is UL2272 Certified, what does this mean? 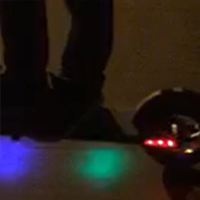 The UL2272 standard was created in early 2016, as response to concerns about the safety of ‘Hoverboards’. 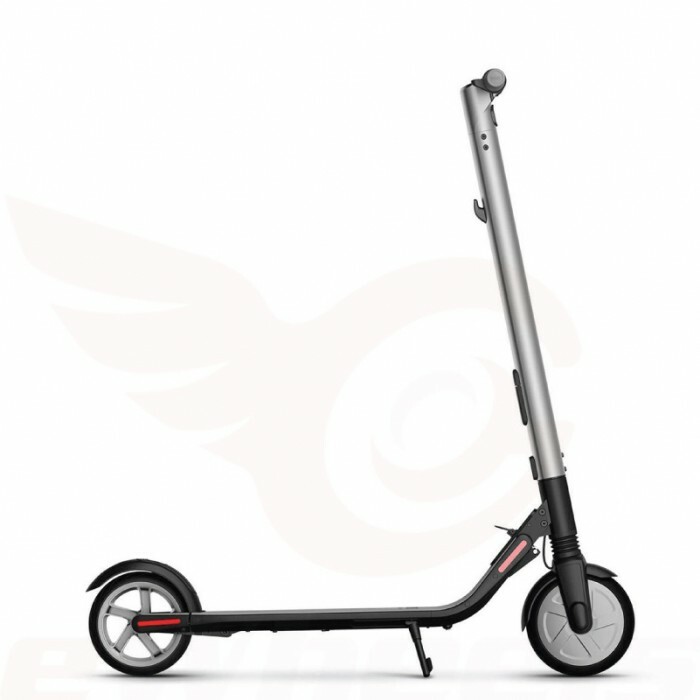 Since then, the standard has been adapted for other equipment such as electric Scooters. 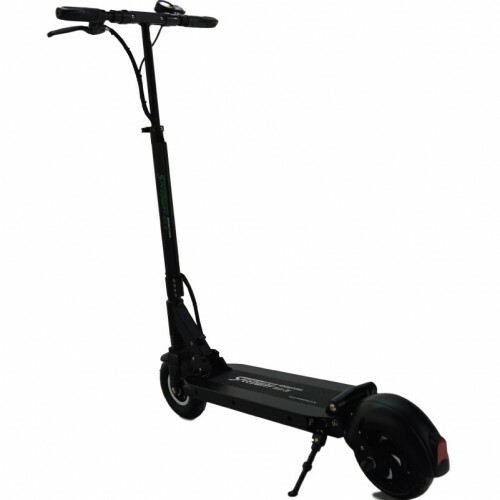 In purchasing a UL certified device, gives you some additional assurance that the Scooter will not catastrophically fail when faced with an extreme loads & has other safety monitoring/handling incorporated into the system. I purchased an ES2 from somewhere else, can I buy the extra battery pack here? Unfortunately, owing to limited supply, we are only able to offer the external battery to our Customers. 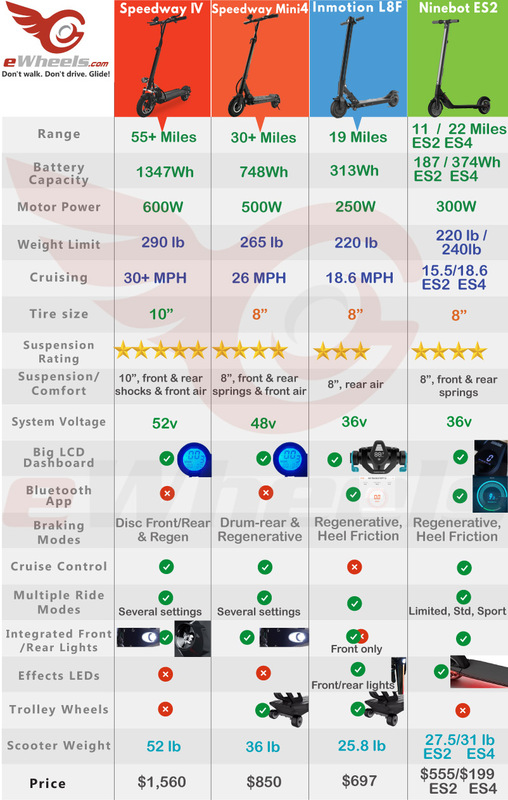 What are the Pros/Cons of using Electrical vs. heel brakes? What type of warranty is available on the ES2? 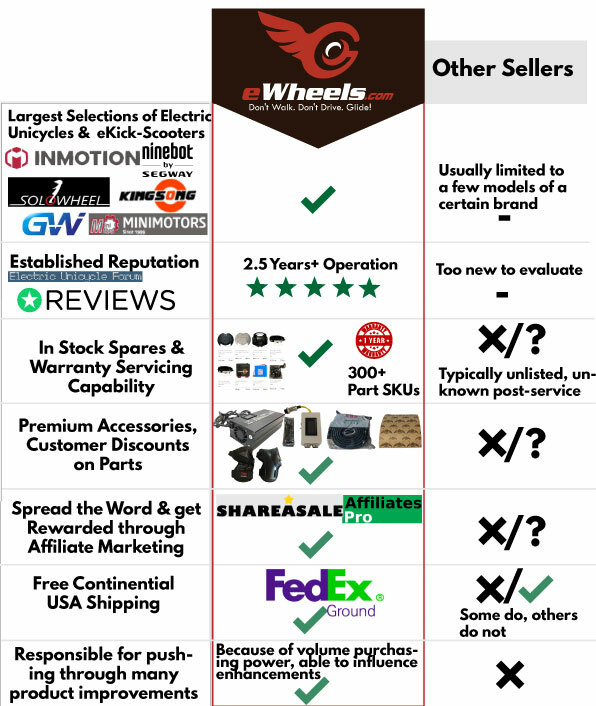 One of the distinguishing selling points in buying from eWheels, is that we have a dedicated servicing center in Arizona to deal with warranty related issues, this covers parts & labour but not the shipping costs, which may be between $30-$105 (within the US), depending on the distance from our repair centre. It does not cover consumables such as the tire. Exclusions to the warranty are where there is evidence of water damage, abuse, or commercial use. Will you be offering spare parts? Yes, we have 20+ different parts, nearly everything needed to reconstruct a scooter from scratch. These will be posted onto the parts section of the website in a couple weeks. Can I take the Scooter on a plane? Unfortunately not. 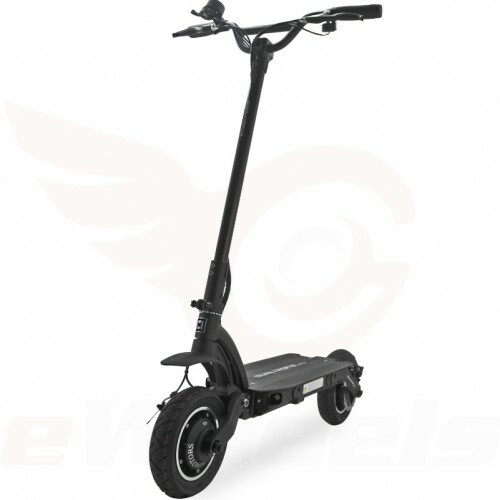 The maximum permitted battery size on a commercial airline is 160Wh, & it needs to be removable, neither condition of which is met with this Scooter. [/fusion_text][/fusion_builder_column][/fusion_builder_row][/fusion_builder_container][fusion_builder_container admin_label="" hundred_percent="no" equal_height_columns="no" menu_anchor="" hide_on_mobile="small-visibility,medium-visibility,large-visibility" class="" id="" background_color="" background_image="" background_position="center center" background_repeat="no-repeat" fade="no" background_parallax="none" enable_mobile="no" parallax_speed="0.3" video_mp4="" video_webm="" video_ogv="" video_url="" video_aspect_ratio="16:9" video_loop="yes" video_mute="yes" video_preview_image="" border_size="" border_color="" border_style="solid" margin_top="0" margin_bottom="" padding_top="0" padding_right="" padding_bottom="" padding_left=""][fusion_builder_row][fusion_builder_column type="1_1" layout="1_1" spacing="" center_content="no" hover_type="none" link="" min_height="" hide_on_mobile="small-visibility,medium-visibility,large-visibility" class="" id="" background_color="" background_image="" background_position="left top" background_repeat="no-repeat" border_size="0" border_color="" border_style="solid" border_position="all" padding_top="" padding_right="" padding_bottom="" padding_left="" dimension_margin="" animation_type="" animation_direction="left" animation_speed="0.3" animation_offset="" last="no"][fusion_title margin_top="" margin_bottom="" hide_on_mobile="small-visibility,medium-visibility,large-visibility" class="" id="" size="2" content_align="center" style_type="default" sep_color=""] How Does It Compare? [/fusion_title][/fusion_builder_column][fusion_builder_column type="1_1" layout="1_1" spacing="" center_content="no" hover_type="none" link="" min_height="" hide_on_mobile="small-visibility,medium-visibility,large-visibility" class="" id="" background_color="" background_image="" background_position="left top" background_repeat="no-repeat" border_size="0" border_color="" border_style="solid" border_position="all" padding_top="" padding_right="" padding_bottom="" padding_left="" dimension_margin="" animation_type="" animation_direction="left" animation_speed="0.3" animation_offset="" last="no"][fusion_imageframe image_id="19942" style_type="dropshadow" stylecolor="" hover_type="none" bordersize="" bordercolor="" borderradius="" align="center" lightbox="no" gallery_id="" lightbox_image="" alt="" link="" linktarget="_self" hide_on_mobile="small-visibility,medium-visibility,large-visibility" class="" id="" animation_type="" animation_direction="left" animation_speed="0.3" animation_offset=""]https://www.ewheels.com/wp-content/uploads/2018/05/eScooter-Competitive-Comparison-v3.2.jpg[/fusion_imageframe][/fusion_builder_column][/fusion_builder_row][/fusion_builder_container][fusion_builder_container hundred_percent="no" equal_height_columns="no" menu_anchor="" hide_on_mobile="small-visibility,medium-visibility,large-visibility" class="" id="" background_color="" background_image="" background_position="center center" background_repeat="no-repeat" fade="no" background_parallax="none" enable_mobile="no" parallax_speed="0.3" video_mp4="" video_webm="" video_ogv="" video_url="" video_aspect_ratio="16:9" video_loop="yes" video_mute="yes" video_preview_image="" border_size="" border_color="" border_style="solid" margin_top="" margin_bottom="" padding_top="" padding_right="" padding_bottom="" padding_left=""][fusion_builder_row][fusion_builder_column type="1_1" layout="1_1" spacing="" center_content="no" hover_type="none" link="" min_height="" hide_on_mobile="small-visibility,medium-visibility,large-visibility" class="" id="" background_color="" background_image="" background_position="left top" background_repeat="no-repeat" border_size="0" border_color="" border_style="solid" border_position="all" padding_top="" padding_right="" padding_bottom="" padding_left="" dimension_margin="" animation_type="" animation_direction="left" animation_speed="0.3" animation_offset="" last="no"][fusion_title margin_top="" margin_bottom="" hide_on_mobile="small-visibility,medium-visibility,large-visibility" class="" id="" size="2" content_align="center" style_type="default" sep_color=""] Dashboard Information Screeen [/fusion_title][/fusion_builder_column][fusion_builder_column type="1_2" layout="1_2" spacing="" center_content="no" hover_type="none" link="" min_height="" hide_on_mobile="small-visibility,medium-visibility,large-visibility" class="" id="" background_color="" background_image="" background_position="left top" background_repeat="no-repeat" border_size="0" border_color="" border_style="solid" border_position="all" padding_top="" padding_right="" padding_bottom="" padding_left="" dimension_margin="" animation_type="" animation_direction="left" animation_speed="0.3" animation_offset="" last="no"][fusion_imageframe image_id="19401" style_type="bottomshadow" stylecolor="" hover_type="zoomin" bordersize="" bordercolor="" borderradius="" align="center" lightbox="no" gallery_id="" lightbox_image="" alt="" link="" linktarget="_self" hide_on_mobile="small-visibility,medium-visibility,large-visibility" class="" id="" animation_type="" animation_direction="left" animation_speed="0.3" animation_offset=""]https://www.ewheels.com/wp-content/uploads/2018/04/ES-Dashboard.jpg[/fusion_imageframe][/fusion_builder_column][fusion_builder_column type="1_2" layout="1_2" spacing="0" center_content="yes" hover_type="none" link="" min_height="none" hide_on_mobile="small-visibility,medium-visibility,large-visibility" class="" id="" background_color="" background_image="" background_position="left top" undefined="" background_repeat="no-repeat" border_size="0" border_color="" border_style="solid" border_position="all" padding_top="" padding_right="" padding_bottom="" padding_left="" margin_top="" margin_bottom="" animation_type="" animation_direction="left" animation_speed="0.3" animation_offset="" last="no"][fusion_text] The backlit LCD Dashboard gives you an overview of the Scooter's vital stats, like the speed, Bluetooth status, power mode, & battery level. It's designed to be visible in direct sunlight & from a variety of angles. 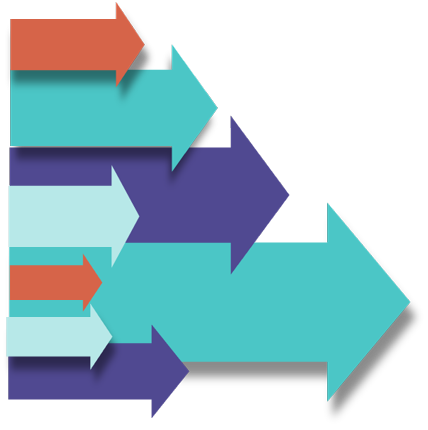 [/fusion_text][fusion_separator style_type="none" hide_on_mobile="small-visibility,medium-visibility,large-visibility" class="" id="" sep_color="" top_margin="25" bottom_margin="" border_size="" icon="" icon_circle="" icon_circle_color="" width="" alignment="center" /][fusion_text] You can activate the front/rear lighting by pressing & holding the power button down for 2 seconds. 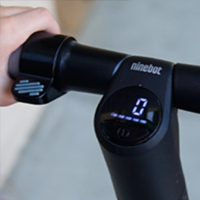 Other configuration setup can be performed from within the Ninebot App. [/fusion_text][/fusion_builder_column][/fusion_builder_row][/fusion_builder_container][fusion_builder_container hundred_percent="no" equal_height_columns="no" menu_anchor="" hide_on_mobile="small-visibility,medium-visibility,large-visibility" class="" id="" background_color="" background_image="" background_position="center center" background_repeat="no-repeat" fade="no" background_parallax="none" enable_mobile="no" parallax_speed="0.3" video_mp4="" video_webm="" video_ogv="" video_url="" video_aspect_ratio="16:9" video_loop="yes" video_mute="yes" video_preview_image="" border_size="" border_color="" border_style="solid" margin_top="" margin_bottom="" padding_top="" padding_right="" padding_bottom="" padding_left=""][fusion_builder_row][fusion_builder_column type="1_1" layout="1_1" spacing="" center_content="no" hover_type="none" link="" min_height="" hide_on_mobile="small-visibility,medium-visibility,large-visibility" class="" id="" background_color="" background_image="" background_position="left top" undefined="" background_repeat="no-repeat" border_size="0" border_color="" border_style="solid" border_position="all" padding_top="" padding_right="" padding_bottom="" padding_left="" margin_top="" margin_bottom="" animation_type="" animation_direction="left" animation_speed="0.3" animation_offset="" last="no"][fusion_title margin_top="" margin_bottom="" hide_on_mobile="small-visibility,medium-visibility,large-visibility" class="" id="" size="2" content_align="center" style_type="default" sep_color=""] Overview of the Ninebot/Segway ES2 [/fusion_title][/fusion_builder_column][fusion_builder_column type="1_1" layout="1_2" spacing="" center_content="no" hover_type="none" link="" min_height="" hide_on_mobile="small-visibility,medium-visibility,large-visibility" class="" id="" background_color="" background_image="" background_position="left top" background_repeat="no-repeat" border_size="0" border_color="" border_style="solid" border_position="all" padding_top="" padding_right="" padding_bottom="" padding_left="" dimension_margin="" animation_type="" animation_direction="left" animation_speed="0.3" animation_offset="" last="no"][fusion_imageframe image_id="19398" style_type="bottomshadow" stylecolor="" hover_type="liftup" bordersize="" bordercolor="" borderradius="" align="center" lightbox="no" gallery_id="" lightbox_image="" alt="" link="" linktarget="_self" hide_on_mobile="small-visibility,medium-visibility,large-visibility" class="" id="" animation_type="" animation_direction="left" animation_speed="0.3" animation_offset=""]https://www.ewheels.com/wp-content/uploads/2018/04/Features-of-the-ES2-Scooter.jpg[/fusion_imageframe][/fusion_builder_column][/fusion_builder_row][/fusion_builder_container][fusion_builder_container background_color="#f1f1f1" background_image="" background_parallax="none" enable_mobile="no" parallax_speed="0.3" background_repeat="no-repeat" background_position="center center" video_url="" video_aspect_ratio="16:9" video_webm="" video_mp4="" video_ogv="" video_preview_image="" overlay_color="" video_mute="yes" video_loop="yes" fade="no" border_size="0px" border_color="" border_style="solid" padding_top="20px" padding_bottom="0" padding_left="0" padding_right="0" hundred_percent="no" equal_height_columns="no" hide_on_mobile="no" menu_anchor="" class="" id=""][fusion_builder_row][fusion_builder_column type="1_1" layout="1_2" last="no" spacing="yes" center_content="no" hide_on_mobile="no" background_color="#f1f1f1" background_image="" background_repeat="no-repeat" background_position="left top" border_position="all" border_size="0px" border_color="" border_style="solid" padding_top="0px" padding_right="0px" padding_bottom="0px" padding_left="0px" margin_top="0px" margin_bottom="0px" animation_type="0" animation_direction="down" animation_speed="0.1" class="" id="" min_height="" hover_type="none" link=""][fusion_title margin_top="" margin_bottom="" hide_on_mobile="small-visibility,medium-visibility,large-visibility" class="" id="" size="2" content_align="center" style_type="default" sep_color=""] Transforming the ES2 into the ES4 in Seconds [/fusion_title][fusion_imageframe image_id="19406" style_type="bottomshadow" stylecolor="" hover_type="liftup" bordersize="" bordercolor="" borderradius="" align="center" lightbox="no" gallery_id="" lightbox_image="" alt="" link="" linktarget="_self" hide_on_mobile="small-visibility,medium-visibility,large-visibility" class="" id="" animation_type="" animation_direction="left" animation_speed="0.3" animation_offset=""]https://www.ewheels.com/wp-content/uploads/2018/04/ES4_Battery_Pack_Option-1.jpg[/fusion_imageframe][/fusion_builder_column][fusion_builder_column type="1_2" layout="1_2" last="yes" spacing="yes" center_content="no" hide_on_mobile="no" background_color="" background_image="" background_repeat="no-repeat" background_position="left top" border_position="all" border_size="0px" border_color="" border_style="solid" padding_top="" padding_right="" padding_bottom="" padding_left="" margin_top="0px" margin_bottom="0px" animation_type="0" animation_direction="down" animation_speed="0.1" class="" id="" min_height="" hover_type="none" link=""][fusion_text] The coolest feature that made the ES2 attractive to us at eWheels, is the external battery pack option. Ninebot markets the ES2 + battery pack as the ES4. There are a few other products where you can plug in an external pack, to supplement the primary, but what is exceptional about the implementation on the ES2, is that the controller adapts its maximum speed & power once you plug it in. 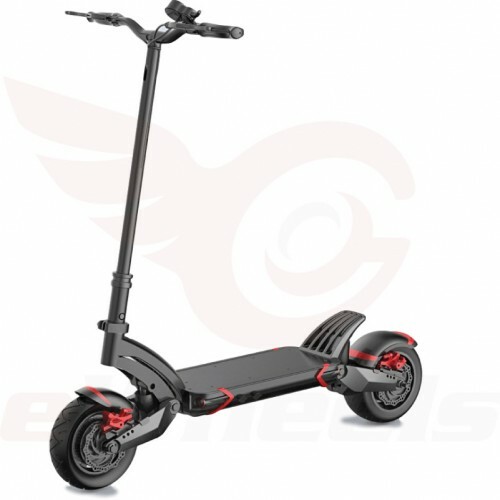 Furthermore, these batteries can be charged independently of each other, thus doubling the charge rate, minimizing downtime for waiting to top up your Scooter. [/fusion_text][/fusion_builder_column][fusion_builder_column type="1_2" layout="1_2" last="yes" spacing="yes" center_content="no" hide_on_mobile="no" background_color="" background_image="" background_repeat="no-repeat" background_position="left top" border_position="all" border_size="0px" border_color="" border_style="solid" padding_top="" padding_right="" padding_bottom="" padding_left="" margin_top="0px" margin_bottom="0px" animation_type="0" animation_direction="down" animation_speed="0.1" class="" id="" min_height="" hover_type="none" link=""][fusion_text] Ninebot claims that the two batteries can be used at different charge levels; if this is true, it means you can also slot in the external one, to continue your journey, if the integrated pack is running low. From our fairly extensive experience with battery powered transport, we'd recommend keeping both pack at the same level for maximum performance. [/fusion_text][/fusion_builder_column][/fusion_builder_row][/fusion_builder_container][fusion_builder_container hundred_percent="no" hundred_percent_height="no" hundred_percent_height_scroll="no" hundred_percent_height_center_content="yes" equal_height_columns="no" menu_anchor="" hide_on_mobile="no" class="" id="" background_color="#ffffff" background_image="" background_position="center center" background_repeat="no-repeat" fade="no" background_parallax="none" enable_mobile="no" parallax_speed="0.3" video_mp4="" video_webm="" video_ogv="" video_url="" video_aspect_ratio="16:9" video_loop="yes" video_mute="yes" video_preview_image="" border_size="0px" border_color="" border_style="solid" margin_top="" margin_bottom="" padding_top="20px" padding_right="0" padding_bottom="0" padding_left="0"][fusion_builder_row][fusion_builder_column type="1_1" layout="1_2" last="no" spacing="yes" center_content="no" hide_on_mobile="no" background_color="#f1f1f1" background_image="" background_repeat="no-repeat" background_position="left top" border_position="all" border_size="0px" border_color="" border_style="solid" padding_top="0px" padding_right="0px" padding_bottom="0px" padding_left="0px" margin_top="0px" margin_bottom="0px" animation_type="0" animation_direction="down" animation_speed="0.1" class="" id="" min_height="" hover_type="none" link=""][fusion_title margin_top="" margin_bottom="" hide_on_mobile="small-visibility,medium-visibility,large-visibility" class="" id="" size="2" content_align="center" style_type="default" sep_color=""] The Ninebot App [/fusion_title][fusion_imageframe image_id="19407" style_type="bottomshadow" stylecolor="" hover_type="liftup" bordersize="" bordercolor="" borderradius="" align="center" lightbox="no" gallery_id="" lightbox_image="" alt="" link="" linktarget="_self" hide_on_mobile="small-visibility,medium-visibility,large-visibility" class="" id="" animation_type="" animation_direction="left" animation_speed="0.3" animation_offset=""]https://www.ewheels.com/wp-content/uploads/2018/04/ES2_App_Control.jpg[/fusion_imageframe][/fusion_builder_column][fusion_builder_column type="1_2" layout="1_2" last="no" spacing="yes" center_content="yes" hide_on_mobile="no" background_color="" background_image="" background_repeat="no-repeat" background_position="left top" border_position="all" border_size="0px" border_color="" border_style="solid" padding_top="" padding_right="" padding_bottom="" padding_left="" margin_top="" margin_bottom="" animation_type="0" animation_direction="down" animation_speed="0.1" class="" id="" min_height="" hover_type="none" link=""][fusion_text] Ninebot's App is available on both IOS & Android, one of the better Apps produced for the Electric Transport manufacturers. Lighting Configuration: Use the App to set the lighting color, theme of the atmospheric under running-board LEDs. 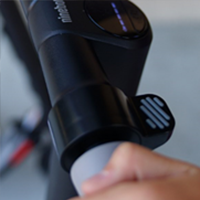 With this feature, you can personalize your Scooter in minutes, to set your unique finishing touch to it. Energy Recovery Level: This is 'passive' braking, on releasing the throttle control, the motor applies a weak braking force through the regenerative system. There are three different levels that can be applied: weak, medium, strong. 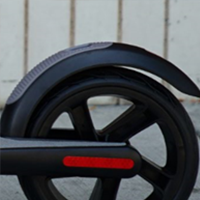 Cruise Control, Enable/Disable: Once enabled, by maintaining the speed for 5 seconds, the Scooter will continue that speed when you take you finger off the throttle. It can be deactivated by pressing the throttle again, or the brake control. I see that the ES2 is UL2272 Certified, what does this mean? The UL2272 standard was created in early 2016, as response to concerns about the safety of ‘Hoverboards’. 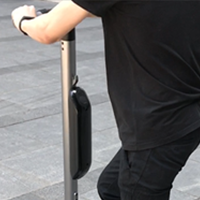 Since then, the standard has been adapted for other equipment such as electric Scooters. 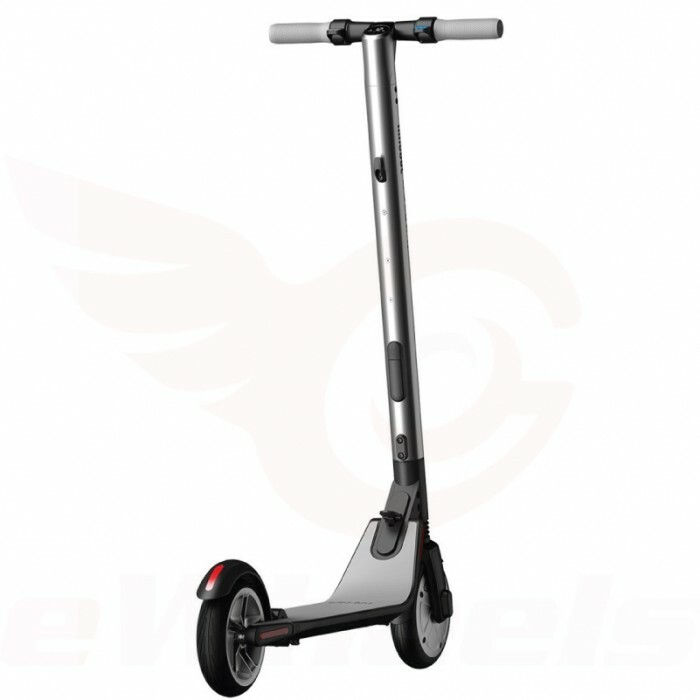 In purchasing a UL certified device, gives you some additional assurance that the Scooter will not catastrophically fail when faced with an extreme loads & has other safety monitoring/handling incorporated into the system. I purchased an ES2 from somewhere else, can I buy the extra battery pack here? Unfortunately, owing to limited supply, we are only able to offer the external battery to our Customers. What type of warranty is available on the ES2? 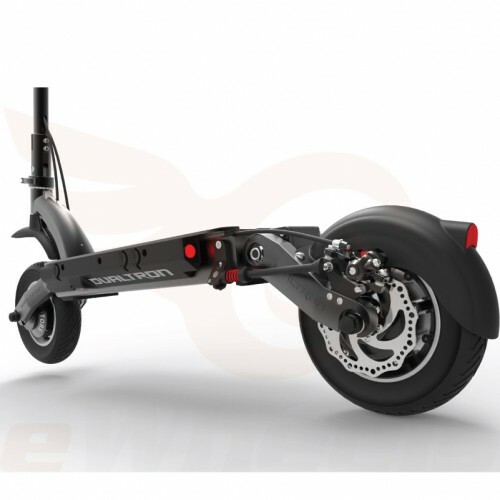 One of the distinguishing selling points in buying from eWheels, is that we have a dedicated servicing center in Arizona to deal with warranty related issues, this covers parts & labour but not the shipping costs, which may be between $30-$105 (within the US), depending on the distance from our repair centre. It does not cover consumables such as the tire. Exclusions to the warranty are where there is evidence of water damage, abuse, or commercial use. Will you be offering spare parts? Yes, we have 20+ different parts, nearly everything needed to reconstruct a scooter from scratch. These will be posted onto the parts section of the website in a couple weeks. Can I take the Scooter on a plane? Unfortunately not. 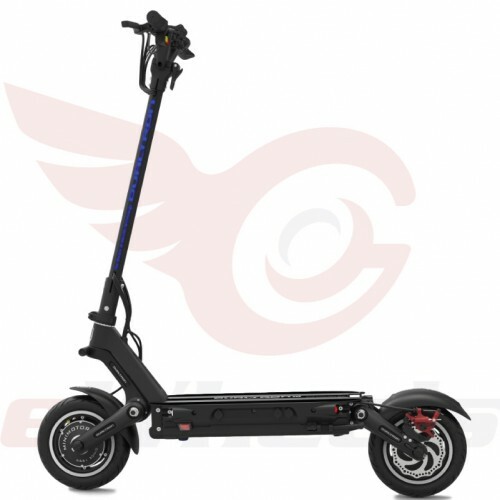 The maximum permitted battery size on a commercial airline is 160Wh, & it needs to be removable, neither condition of which is met with this Scooter.